I’ll be posting more reviews every couple of days in order to give my readers ideas for Holiday gift giving. I’m starting out with two lovely picture books that encapsulate that delightful time in the life of our children between toddler hood and preschool. 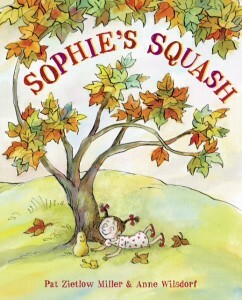 Sophie’s Squash by Pat Zietlow Miller, illustrated by Anne Wilsdorf. Schwartz & Wade. New York, NY, 2013. Ok. I have to admit I love squash. And I enjoy gardening. But even dyed in the wool vegetable haters will be captivated by Sophie and her squash friend, Bernice. Sophie and her parents go to the farm market one day and pick out a perfect butternut squash. “Her parents planned to serve it for supper, but Sophie had other ideas.” It turns out that the squash was “…just the right size to hold in her arms…bounce on her knee” and “to love.” So Sophie draws a face on the squash and wraps it in a blanket. When suppertime comes Sophie tells her mom, “I call her Bernice.” Mom decides on pizza. But the life of a squash is short-lived. Inevitably, they become mushy. The way in which Zietlow Miller leads Sophie to come to learn about the life cycle of a vegetable is endearing. Wilsdorf’s evocative watercolor and ink illustrations beautifully contribute to the satisfying resolution of Bernice’s life. Finally, Sophie’s Squash is not just a sweet little story, but an avenue into a conversation about the circle of life itself. 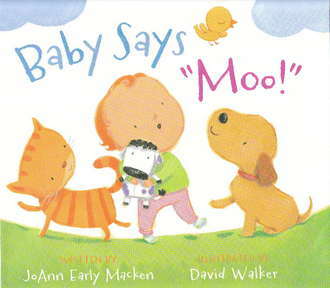 Baby Says “Moo” by JoAnn Early Macken, illustrated by David Walker. Disney Hyperion Books. New York, NY, 2011. “Baby rolls along grabs a yummy snack, waves at people and they all wave back. Baby, what do people say? Baby says ‘Moo’.” This delightful rhyme is accompanied by illustrations of a mother and father pushing their baby in a cart through a grocery store. My one-year-old granddaughter has several words. She definitely knows what she is talking about, but the rest of us have to try to figure out her increasingly long conversations. She clearly says dog and duck. But then there’s another word that sounds like dog that seems to mean a lot of different things. So when I read Baby Says “Moo,” which is about a young child who uses the same word for a variety of animals, I easily saw my granddaughter in the main character. Looking closely at the illustrations, the reader will realize why the baby calls everything “moo.” I won’t give that part away. But what is so special about this book is that it illustrates that sweet and hilarious time when babies are just learning to talk and have a vocabulary all their own. Early Macken’s rhyming lyrics accompanied by Walker’s acrylic paintings are sure to enchant any small child as well as their parents. I am the author of two middle grade novels: Time of the Eagle, published by Blue Horse Books, and Jingo Fever, published by Crickhollow Books. Time of the Eagle is a survival story and takes place during the fur trade era in the Lake Superior region. Jingo Fever takes place during WWI and deals with bullying amidst an anti-immigrant atmosphere.